Look and see Look 'N See! Hope that title doesn't confuse anyone, hah! You aren't seeing double! There's a lot more than that in this post, but I thought it was funny. Yesterday morning, around 2AM, I wrote up a post about some 1956 Topps Jets cards I had acquired. 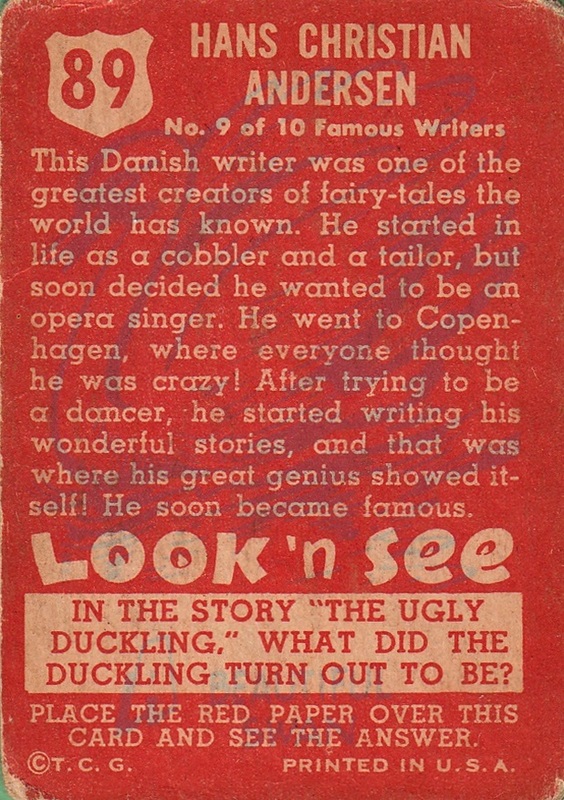 In it, I mentioned that 1952 Topps Look 'N See now held my #1 most wanted non-sport slot. Wouldn't you know it but later that same day, my family took an unexpected trip to the antique mall where my favorite vintage dealer is set up, and he had brought in some Look 'N See since the last time I saw him! What are the odds of that? I never know what he is going to have new, but I didn't expect it to work out that way. I'm not complaining at all! As you can see, they are in rather poor shape, but I don't care. I am thrilled to have them! The backs feature orange writing with a blueish-purple design that tells the answer the trivia question. I know that the cards came with a sheet of red "something" that you put over the card back to reveal the answer, but I don't know exactly what it was. The scanner kind of pulled the blue image enough that you can see it is a swan. After thinking about it overnight, I think my most wanted non-sport set now is 1996 Batman Holo Series, which is entirely made up of holograms. I'm all over the map. Now, of course when I go there I make sure to visit all the card dealers. There are 4 set up full time and occasionally more will set up in the seasonal outdoor section they have. This time, there was a dealer I've never met before outside, and he had some great stuff. Oh yeah! 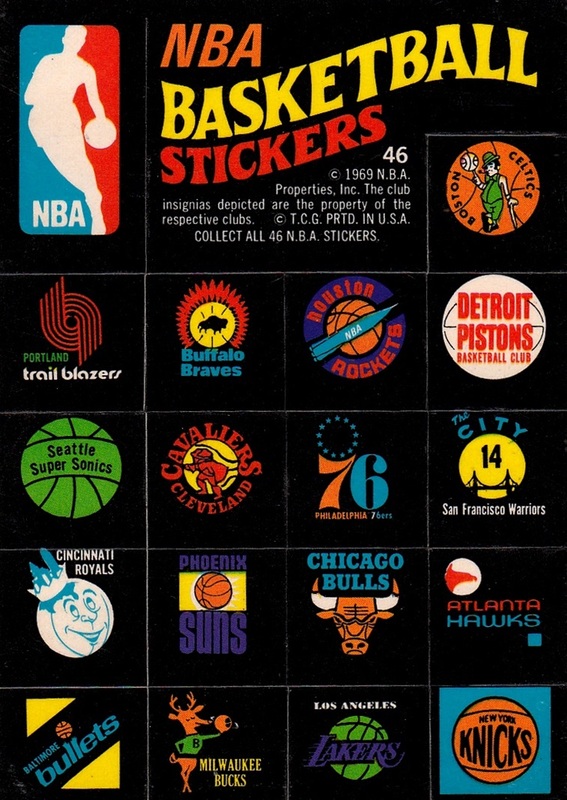 1971-72 Topps Stickers! These were 1-per pack in the 1971-72 Topps set, but they are MUCH rarer than the base cards. I've completed the base set, years ago, but until yesterday I only had one from this set. The team logo stickers! These are the keys to the set in my opinion. These are the first time ABA logos EVER appeared on a trading card, and the first time since 1961-62 for the NBA...much different since then, and they were not in color on the Fleer cards. 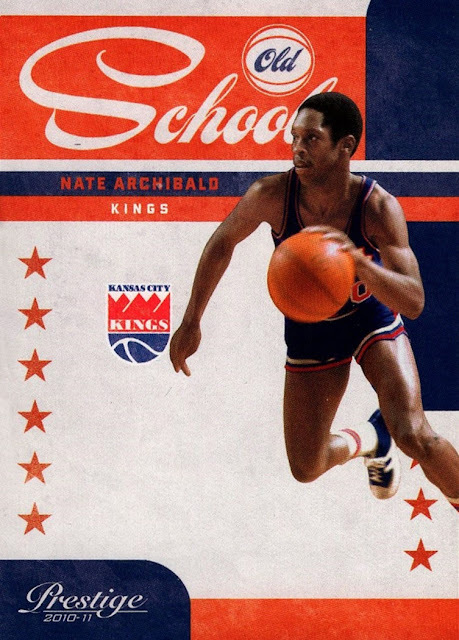 Also, it's interesting because Topps lore has always been that they had the Player's Association licensed, but not the NBA itself, which is why the teams that had their name, not their location, on the jersey front, were worn backwards. Yet here are all the team logos in bright, unmistakable colors. In the very same packs. Makes you think. 1973-74 Topps stickers! An insert into the 1973-74 set, these are in great shape, with almost no adhesive discoloration. I love these. I love team logos and they are rare on cards before the 1980s. Check out that Denver Rockets logo. Is that not great? 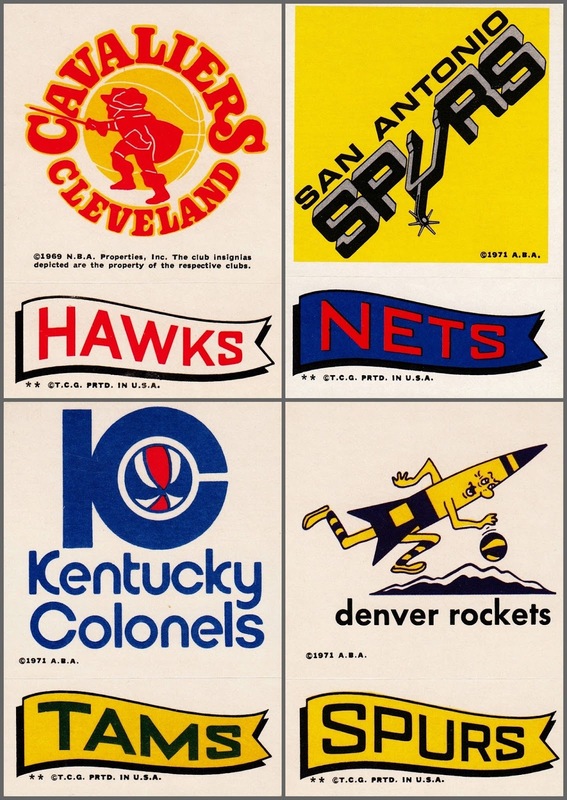 They changed their name to the Nuggets after the season these were issued in and were one of four teams absorbed by the NBA after 1975-76. 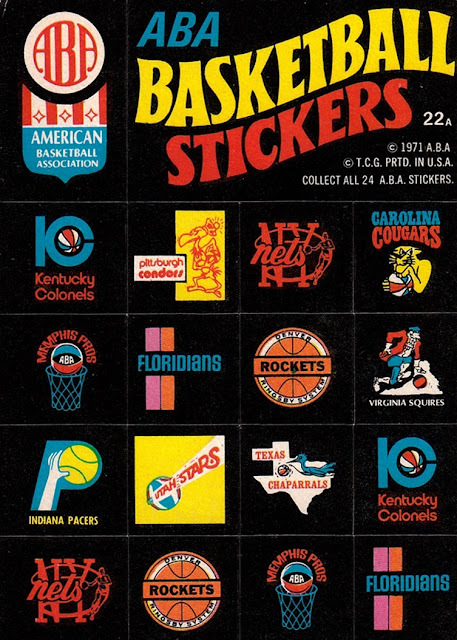 1974 Fleer Cloth Stickers! These are so rare that I could not find a single one for sale on Ebay, and only one on COMC. 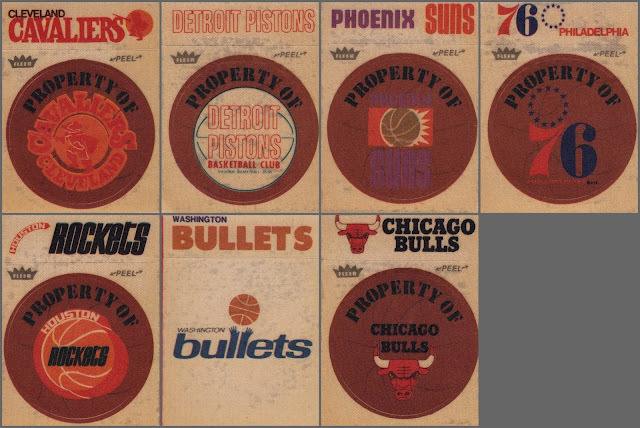 These are from the 1974-75 season, which was the first year of the Washington Bullets. Most places list them as "1974" only but they are unquestionably 1974-75. 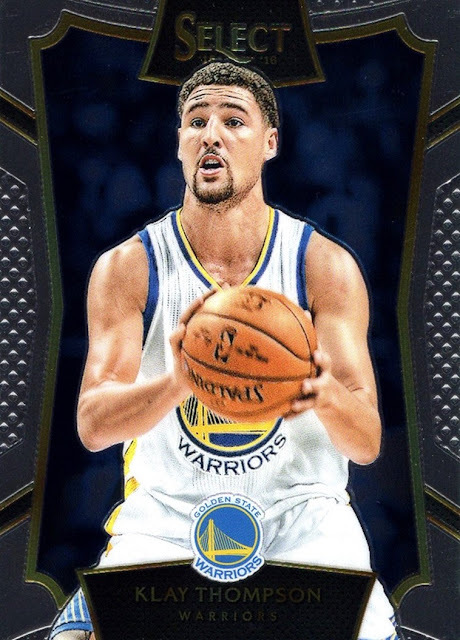 These were the first Fleer issues for the NBA since 1961-62, but the adhesive has damaged all of them...which probably is why they are so cheap when you do find them. (I paid less than a dollar each). I am not sure if they were white borders originally but they are yellowish tan now. Each team in the NBA got one, but these are the first ones I have. Fleer also issued glossy paper team logo stickers from 1977-82 that are also missing from my collection currently. While most of what he had was vintage- not all of it was. This Kanter is SN 49. 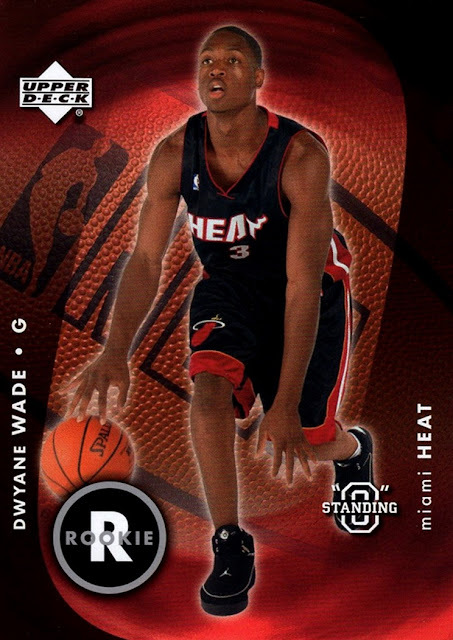 This Deng is SN to 99. Both of these cards are the first I have from the parallel set. A multi-sport card, this is the largest set in my collection...it is card #1127. I know there are some baseball sets that are larger but this is only the second card in my collection where the card number is quadruple digits. The other is from the same set. A Magic Johnson promo. 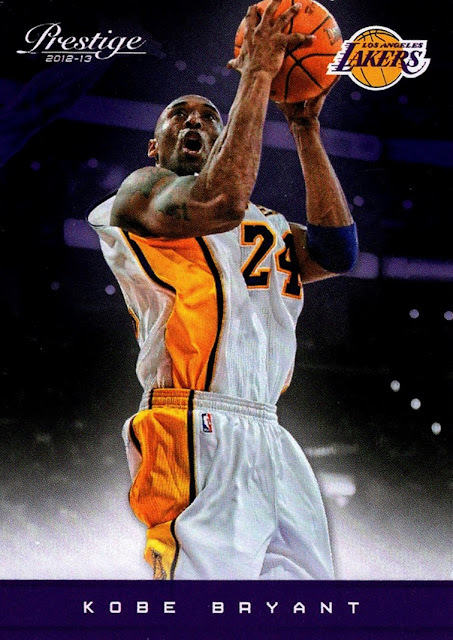 Note the career Laker is wearing an Orlando Magic shirt. I have no idea where this one came from but it's clearly from 1993-94. Gold parallel of 2007-08 Sweet Shot. 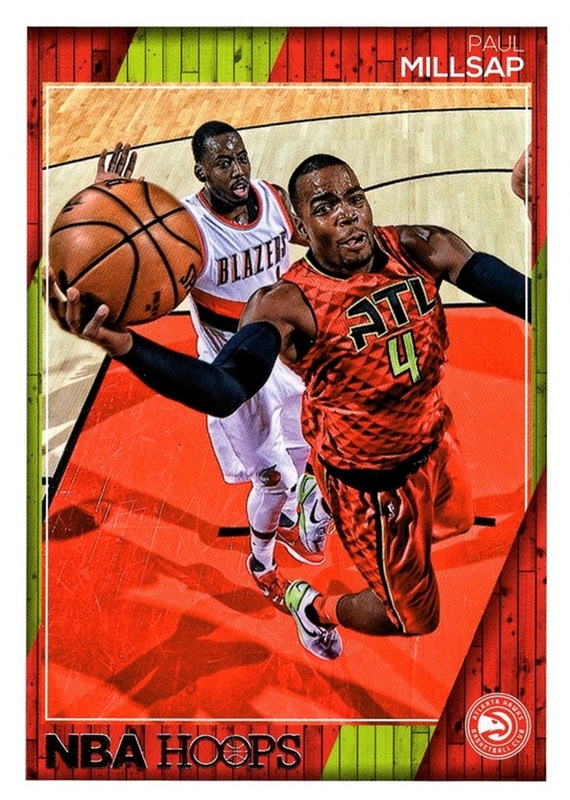 This is only my third card from the set. I don't even know where this LeBron came from! This was the first card I actually found yesterday. I always go for the rare teams when I can. 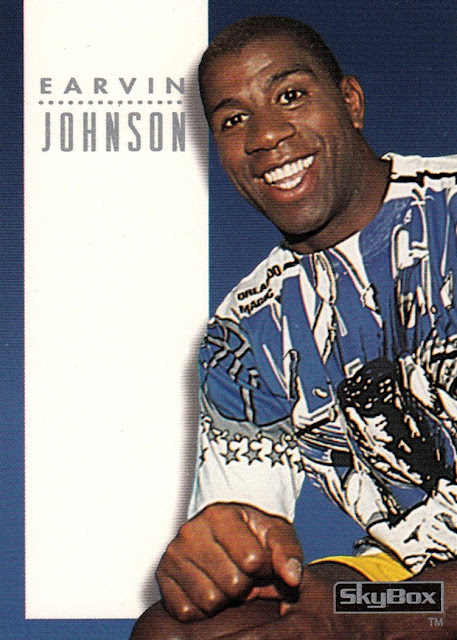 You can tell this insert was designed with an autograph parallel in mind. This one has pretty much everything going for it: It's a 1990s parallel, it's die cut, and it's serially numbered! It's also my first from the Final Cut parallel in my collection. 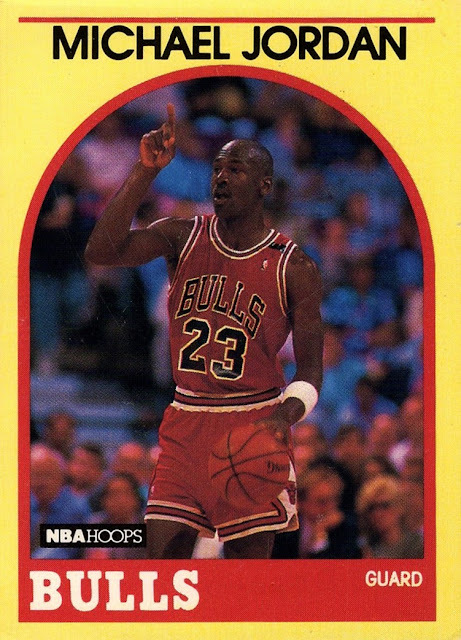 ...and this 1989-90 Hoops 100 Superstars Michael Jordan card. I remember the first time I saw this set, I was already familiar with the 1989-90 Hoops design, and when I got my first one I was SURE that somebody had colored the border with a highlighter. Eventually I leaned better. 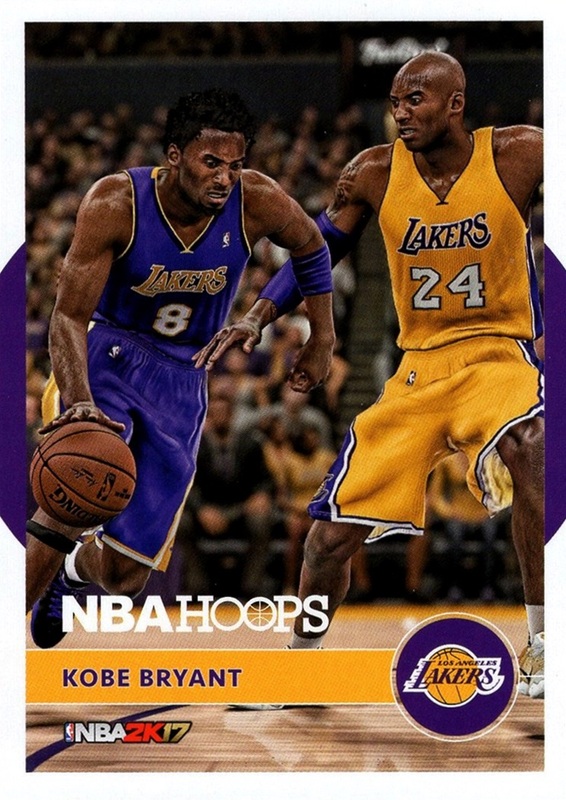 I think I realized it wasn't the case when I got the regular card of the same player and it was a different number. 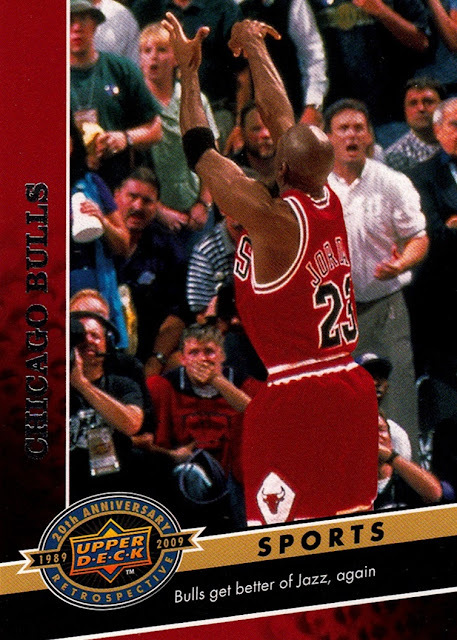 It was Scottie Pippen...I don't know why but I remember getting it in 1996. 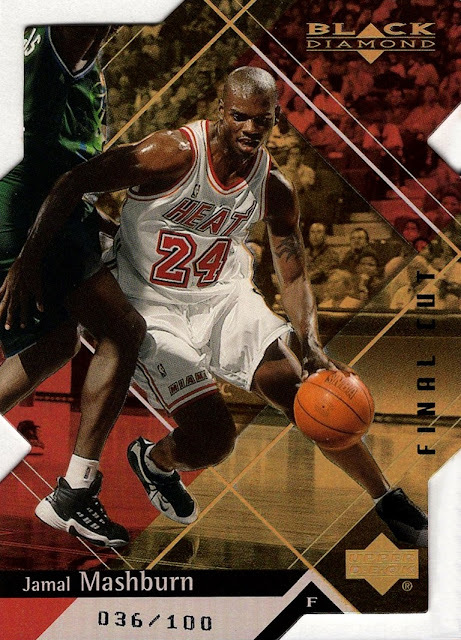 This MJ is not in great shape but I'd rather have a damaged card than no card, you know? He also had this card, which is totally unlike pretty much everything else he has ever had since I've known him for the past few years. It's the first autograph I've seen him have in the about 3 years I've known him. It's also the first relic. 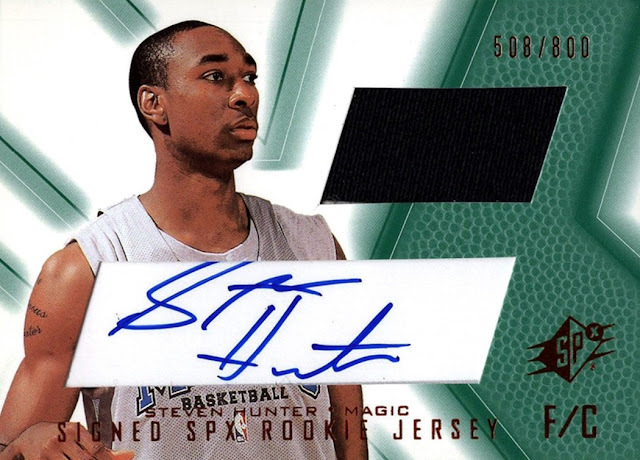 Autographed rookie jersey cards were a staple in SPx beginning in 2000-01. This card is from 2001-02. After paying him, I went to another dealer, that mostly has unopened boxes of late 80s and early 90s baseball and hockey. 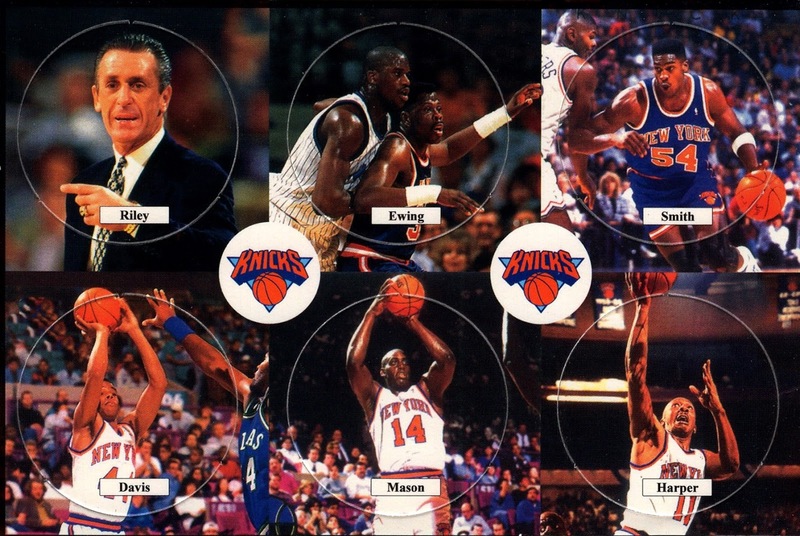 I found a set of Knicks Pogs that I had never seen before there, and promptly added them to my collection. The dealer, who it turned out I knew from Facebook and didn't realize it, thought there were two different versions but all of them in the stack were the same. I think they are from 1994-95. I need to look and see when Charles Smith left the team. I actually was big into Pogs for a little while, back in the day I would have purchased two sets, one to keep as a unit and one to punch out and use. That was a long time ago, although I do still have my pog collection I have not done anything with them in quite some time. I looked it up, it was 1994-95. There is nothing on the back, so I have no idea where they came from. My guess is that they were handed out at a game. Then I visited the final dealer, who has a ton of cards, but finding what you want is kind of akin to prospecting. All the cards are in boxes, but they are not sorted in any way, shape or form. Sure, you'll find runs of various sets or sports, but mostly it's just a total jumble...and I actually kind of like that. It takes longer to go through, but it's kind of fun seeing all kinds of different cards. I've found some really good stuff in those boxes, and I wrote up a post about the first visit I had to that dealer, but I never actually posted it. I usually take home more than 100 cards but this trip I "only" took home 60. Now, I'm not going to post them all but I will post some highlights. 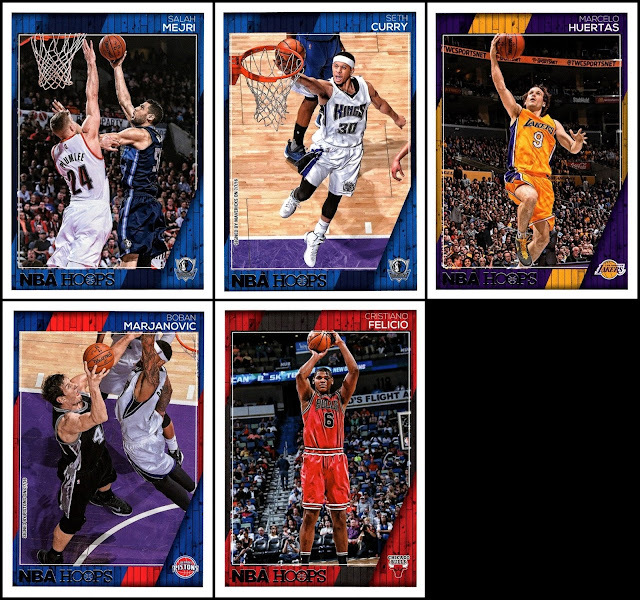 7 cards from 2012-13 Panini Brilliance, 2 of which were base, the rest insert. This Anthony Davis card was one I guessed on. 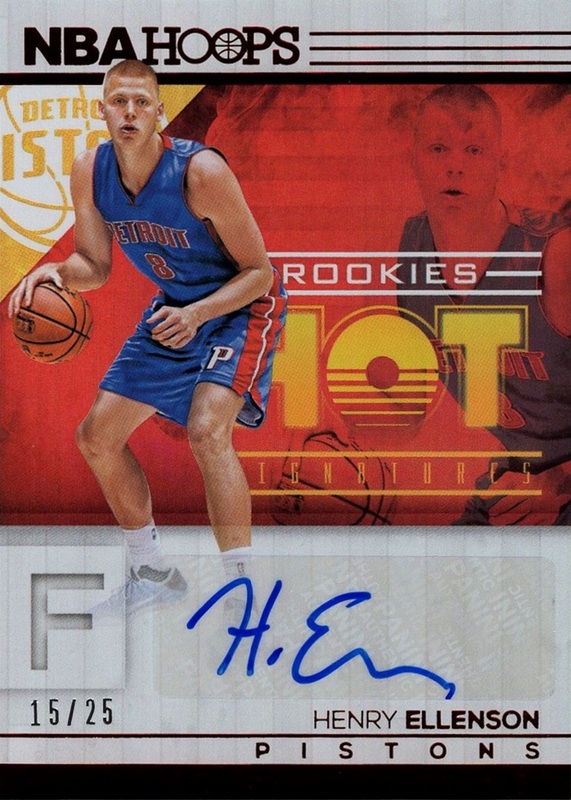 There were several I guessed on whether I needed or not...I thought I already had this one, and I figured if nothing else a RC of him would be good trade bait. As it turned out, all the others I guessed on were duplicates, but THIS one turned out to be one I needed! I wish I had a better memory, but in this case it's kind of funny. 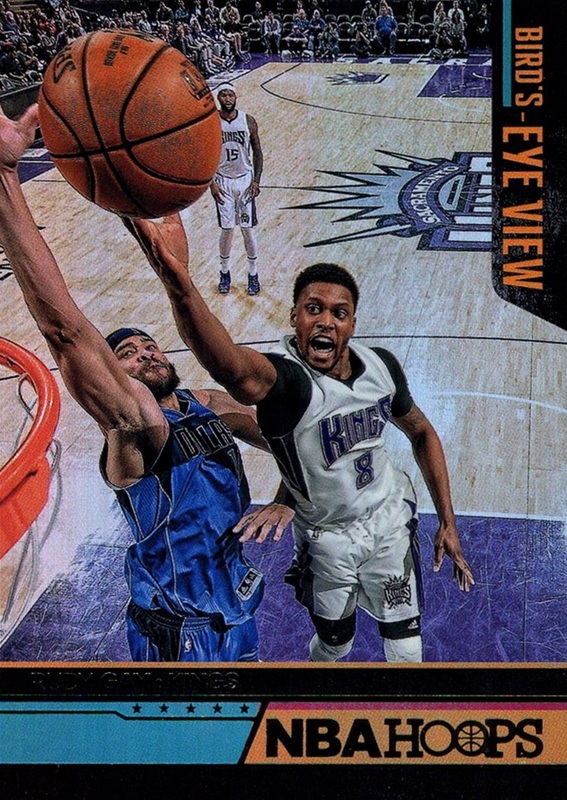 1995-96 SP Premium Collection Holoview of Grant Hill. The last time I got a new insert from 1995-96 SP was 2004. That's been a while! The 2014-15 Prestige set was a Target exclusive, and I don't really like how it was done. The base version was normal card stock, the medium priced version was called Prestige Plus and was mirror foil (this card) and the highest price version was called Prestige Premium and was printed on thick holofoil stock. 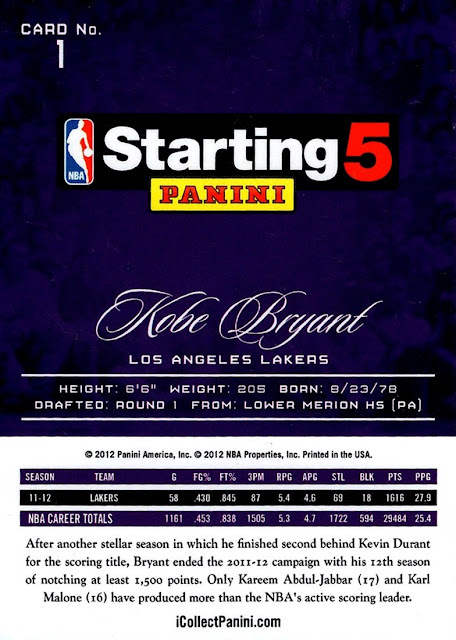 I got lots of the basic version, and I got a Premium box for Christmas that year but I never got any of the Plus cards. I nabbed one on COMC when I finished off the missing sets, but that was an insert. This is my first base card from the Plus set. I got 2 base, 1 Prism parallel and 1 insert from 2013-14 Prizm. 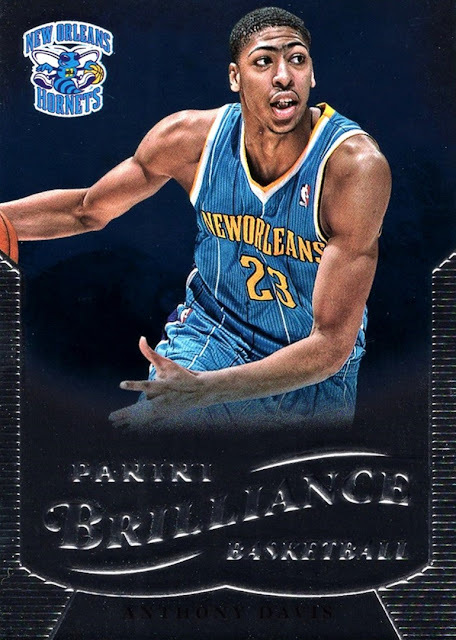 This is my favorite Prizm design. He had more but I have a lot of them and didn't want to spend money on duplicates. Quite a few 2015-16 Select. 10 base and 4 Prizm parallels! 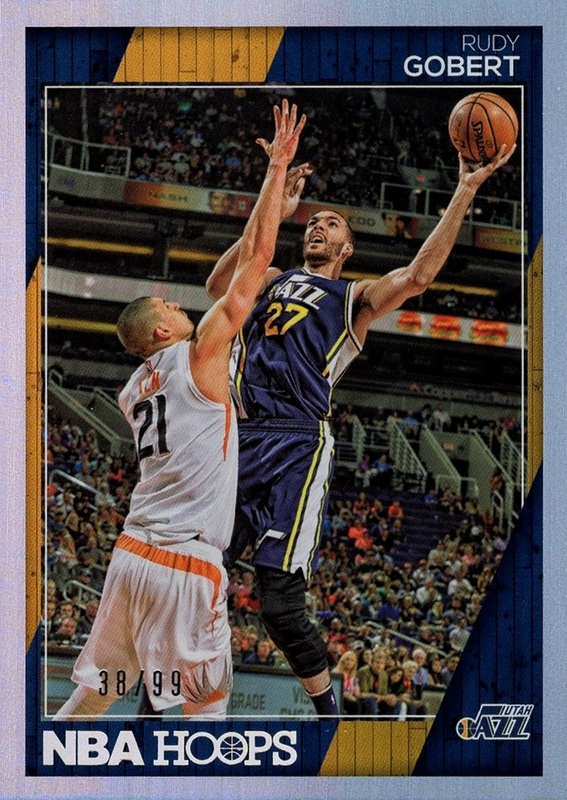 8 2012-13 Marquee base cards and 1 Champions insert. This is probably the best card I got from him. 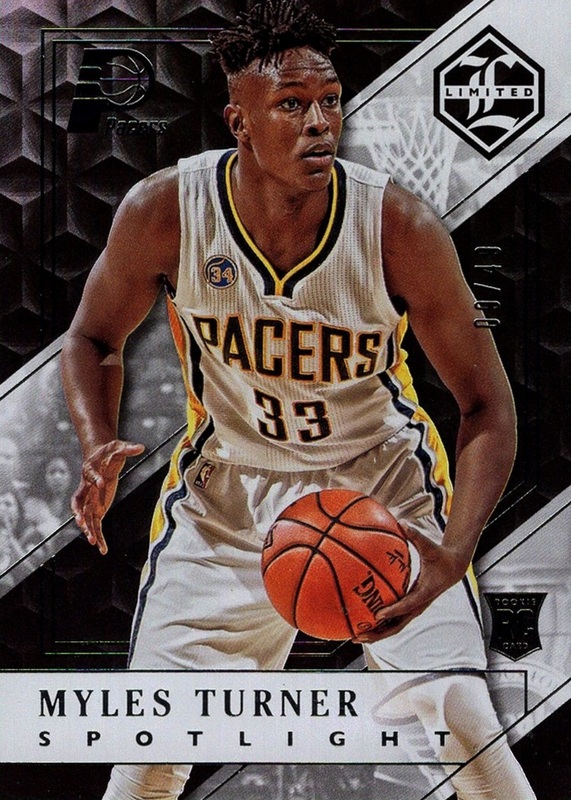 Turner is a great player and this one is SN to only 49! I'm not sure if it's an parallel or a base card. I don't know much about Limited. I've never opened even a single pack of the brand. 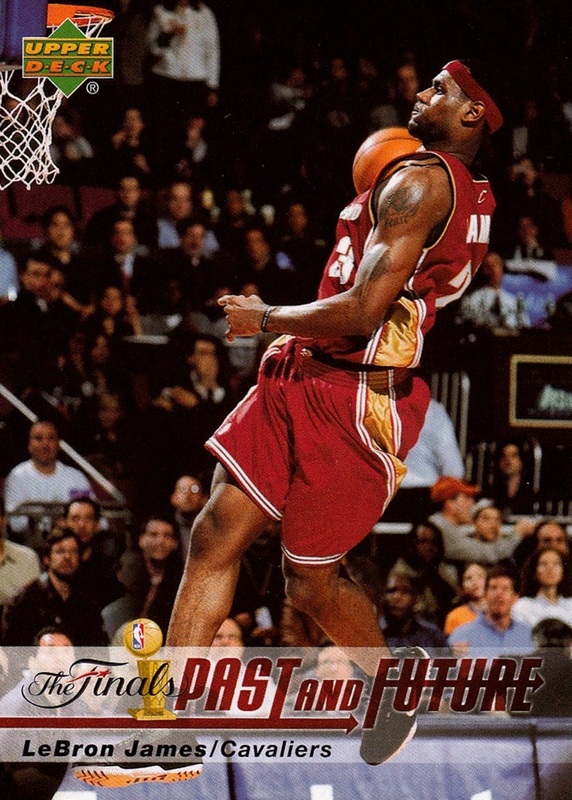 Three inserts from 2003-04 Topps. I didn't realize I was buying three, a Ricky Davis from the same insert was stuck to the back of this one. (no damage to either). Luckily, I needed the Davis too. 4 rookies from 2003-04 Standing O. Last time I went through his boxes, I saw a handful of RC from this set, but I didn't get them. 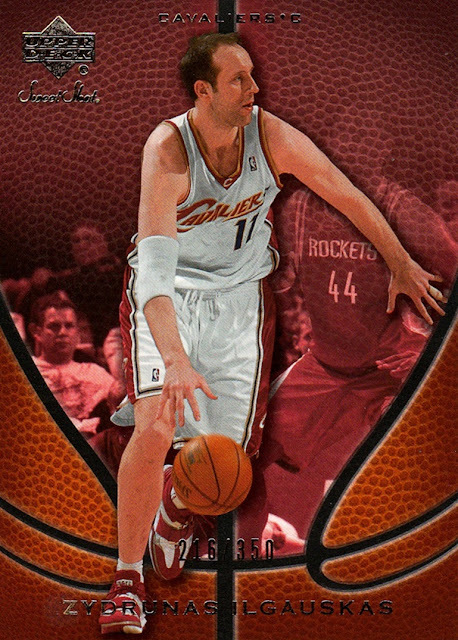 When I got home, I checked my listings and saw I didn't have many from the set, but the only one I remembered him having was Maciej Lampe, who I did have in my collection. When I found them again yesterday they were all still there...except the Lampe! 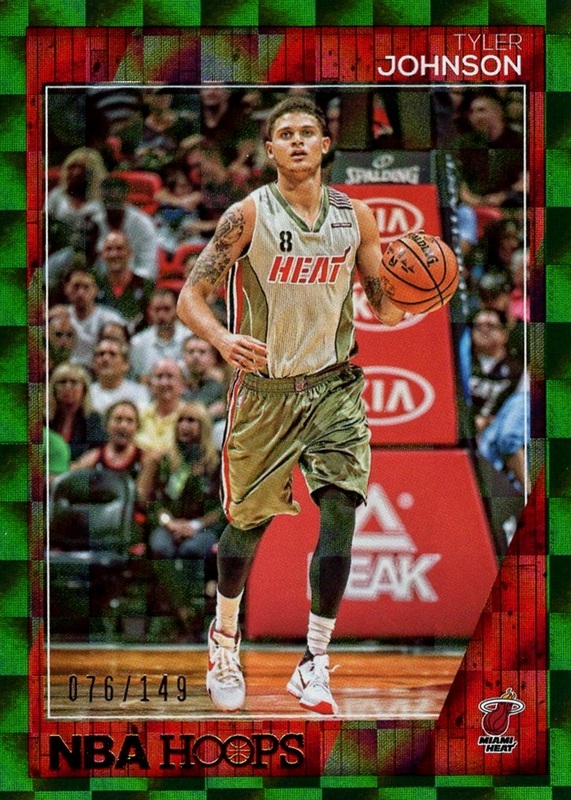 This one threw me at first...I have a lot of 2012-13 Prestige, but this one as you can see is missing the white strip that's on every veteran base card. A Starting 5 contest card! I should have known, as this dealer has been the only place I've seen these Panini contest cards, which they have done since 2010-11 and still did as recently as 2015-16. 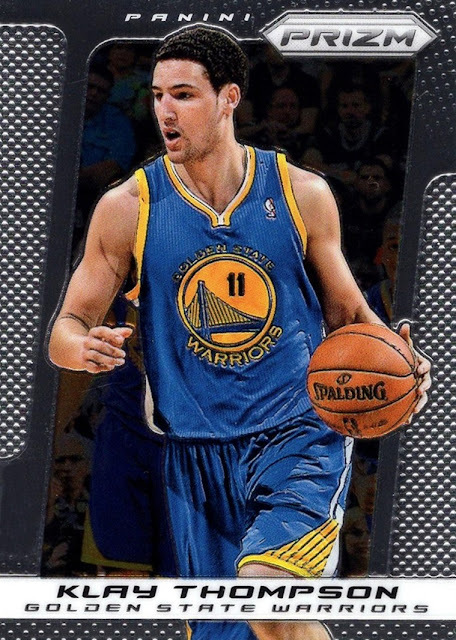 This is the first I've seen from the 2012-13 Prestige set. I didn't know it existed before yesterday. A most wanted set comes to me! That's not something that happens too often, where a set I really want finds me, instead of me making the effort to find it! This past Saturday, October 22nd, my model club, the Hudson Valley Historical Miniatures Guild, held our annual show. One of the vendors there buys collections and I've purchased quite a few things from him before- both models and cards. In fact, I almost completed my 1952 Wings Friend or Foe set from him, bringing me to under 30 of the 200 cards missing, I believe. 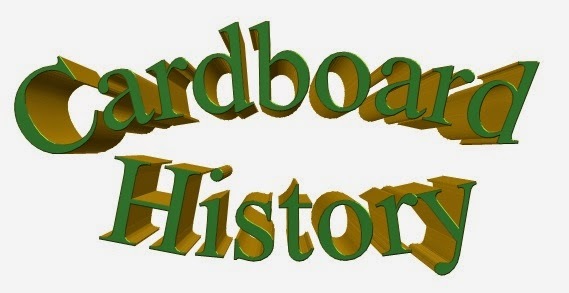 All the 1955 Rails & Sails, 1959 Sicle Air Force, and most of the 1953-54 World On Wheels cards I have came from him too. But, this year, I wasn't expecting to get any cards from him...mainly because I had already cleaned him out on what I needed, and he hasn't brought in any in several years now. 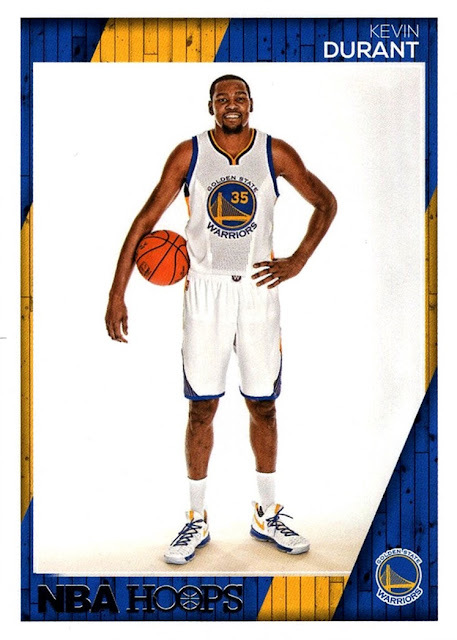 (The last time he had any cards was 2013). It's a sham. (I wish I had thought of it!) . They charge you to do something that any collector who's been collecting more than a day or two should be able to do with their own eyes...and I'm not totally convinced- actually pretty sure, in fact- that they purposely undergrade cards hoping that the clueless owner will resubmit it, meaning they get paid twice to do the exact same thing. They also charge you a sliding scale based on what THEY say the retail price of the card is...yeah, nothing shady there. Here's a shot that shows the two leftmost cards better. The one good thing about graded cards- I've been putting them on my stacks of cards waiting to be scanned when I have my high powered fan on, and it keeps them from blowing away. That's the only good thing I can think it provides. When I find my hobby saw (It disappeared, as my tools sometimes have a tendency of doing as I have no real good place to work, and have to move everything every time I want to work on a model) you can bet money that I will be cutting these out of the current holders they came in. I might even make a video of doing it and post it to the blog. For now, they will continue to act as a paperweight every night. But let me talk about the cards themselves. I was never really into airplanes all that much...until I joined the club mentioned above. I started building things that were not cars...all kinds of things. Now I find that I tend to enjoy doing aircraft and figures more than I do cars, although I'm not particularly good at it. I got a couple of books about aircraft and I really enjoyed it. I soon began collecting airplane cards, and this set, 1956 Topps Jets, was one I really wanted. 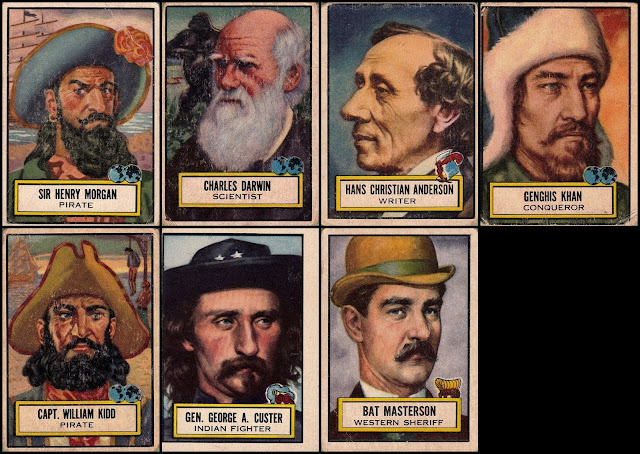 I have tried several times to acquire cards from this set. In fact, it's the set I've tried to add to my collection the longest and kept coming up short. Three times I've bid on cards from this set on Ebay and been outbid. No other set had eluded me so, in fact, it's the ONLY set that's happened with- even though they are fairly common, and in truth didn't sell for all that much when I lost, the fact is- I lost. Any other set I've been trying to add via ebay purchases, if I lost the first one, I was usually able to pick up a different card, or even the same card from a different seller, the same day. Granted, money has been a little tight and I have not looked for these on there in over a year. When I do go on Ebay I tend to lose focus...there are so many great cards that I want to add to my collection (and then blog about!) that it's hard to remember why I went to Ebay to look anyway. 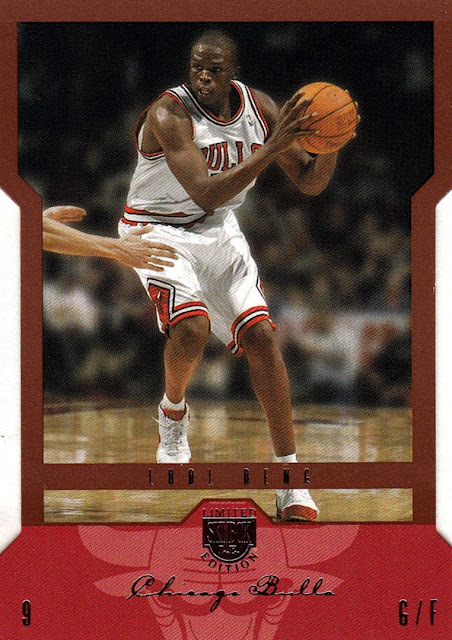 Either way, I finally have 4 cards from this set, and it's been on my wantlist since 2010, when I found out it existed (the year I got back into non-sports after doing only sports from circa 1996-09). What I never really mentioned, though, is that it was the #1 most wanted set from non-sports missing from my collection, especially after I added 1938's Horrors of War and 1966's Batman sets back in September. My #1 most wanted Non-sports set now is probably 1952 Topps Look N See, but I constantly find new sets I had never heard about, especially in the Tobacco era. So Look N See would be the one I've heard about, but maybe the true most wanted is not even known to me yet. 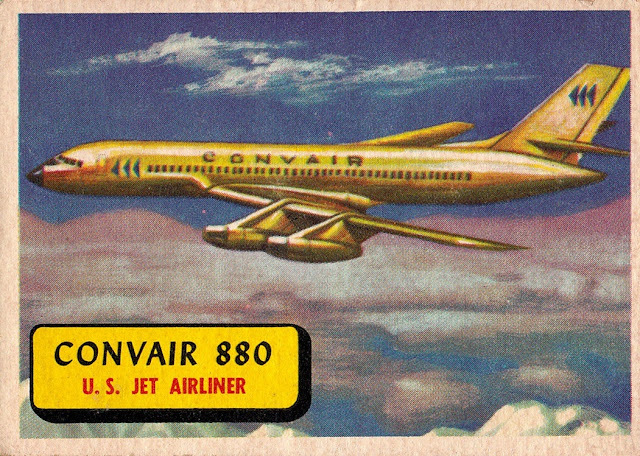 Editorial note: I wrote up this post about the airplane cards about 2 AM on Saturday October 29th. Later in the day I visited my local vintage dealer and what did he have but 7 cards from the Look n See set! Expect a post about them this week! Now I have no idea what my most wanted non-sport set is. I'll try and figure it out so I can discuss it in my Look N See post. The NBA season is here! So let's take a look at the box of Hoops I received as a birthday present on the 18th. Every year the Hoops set is my favorite of the year, and this year is going to be hard to top. The folks at Panini have stepped up the photography chosen for cards in the past several years and the trend continues. I really like the behind the glass shots, but they have other great action shots, too. Some of the players who changed teams- and there were a LOT of them- got studio photos in their new uniforms, while some did not, and have a photo from last season with "traded to/Signed by" the new team and the date on the card front. That is much better then a photoshopped uniform in my opinion. 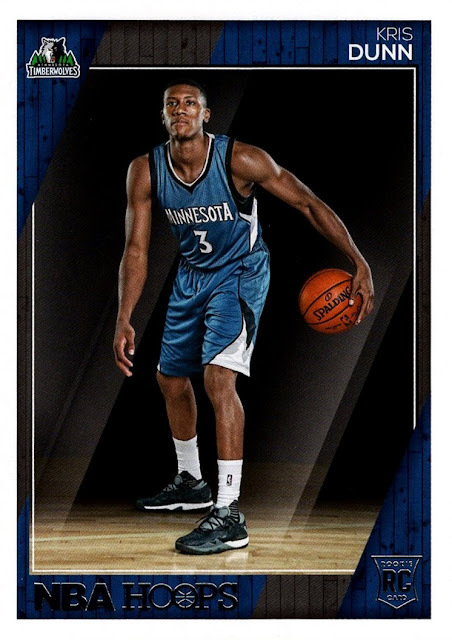 The majority of the rookies- there are 40 included in the set- have photos from the Rookie Photo Shoot in their new uniforms. If Kris Dunn wins rookie of the year- a definite possibility- he would be the third consecutive Timberwolves player to win the award, which would be the first time in NBA history. 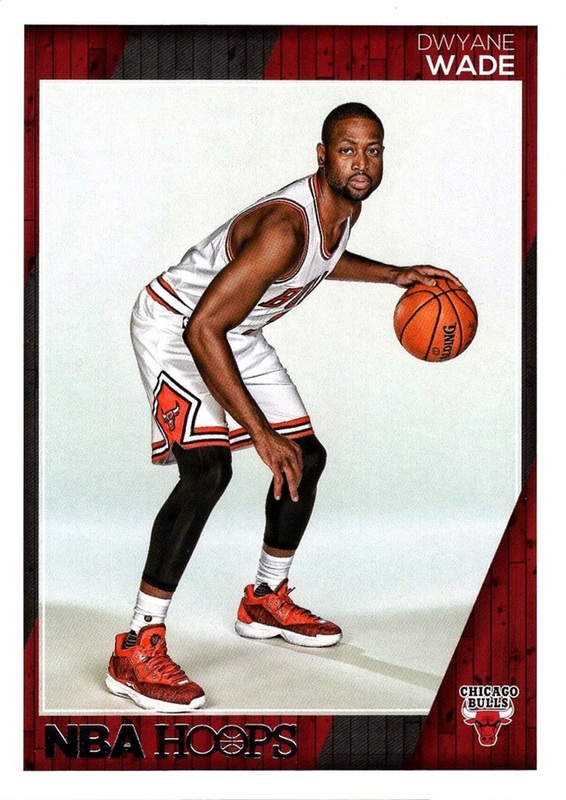 I really love the design of the set this year...I usually do but this one is better than the last two...and really loved last year's set- it was the first Panini era Hoops set I actually completed. The one problem- and I know, this is a broken record by now- but the set is too small. 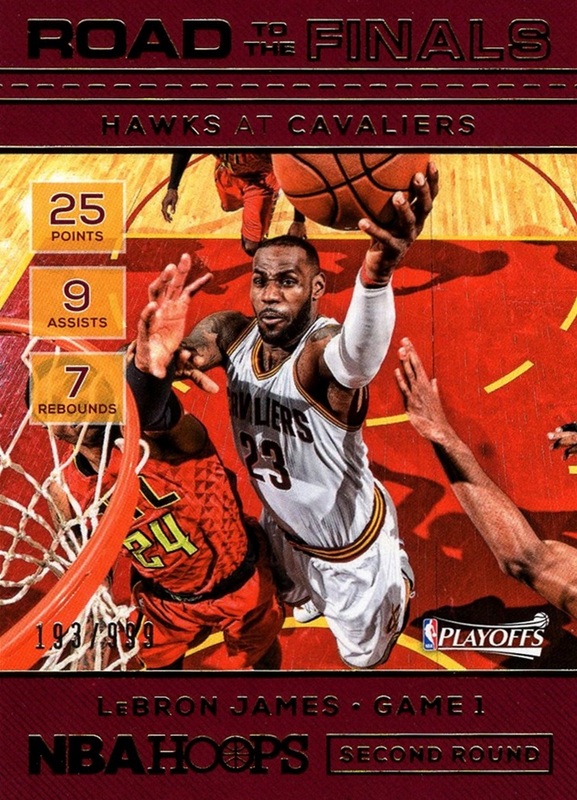 As the flagship set of the NBA, 300 cards is simply not enough to cover a 450 man league. 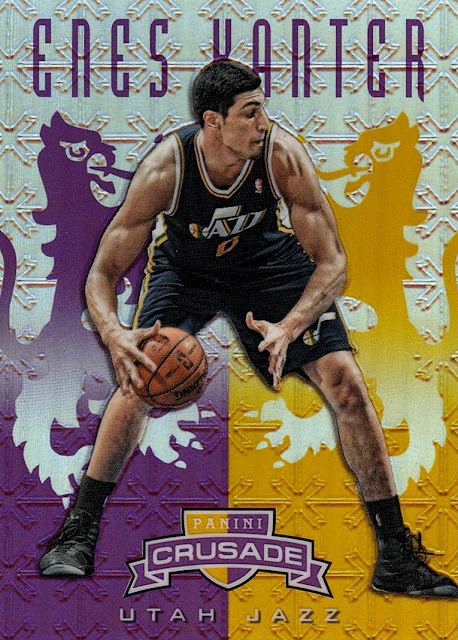 Because the set was issued so early, there are some players included with teams they no longer play for- in fact, there has already been a trade made this season after the set came out, but half of it won't matter, because Panini did not bother to give one of the two players a card. (Tony Snell) Jarrett Jack, former Net, signed with the Hawks during the off-season but was cut two days ago- he now has a card with a team he will probably never play with. It happens sometimes. There are players now in their 5th season in the League who still do not have a SINGLE CARD. That is inexcusable and my only real problem with Panini's issues. There were 6 veteran players who did not yet appear in my collection, and I got 5 of them. Mejri, Huertas, Marjanovic and Felicio were all rookies in 2015-16 and all got cards, but I was not lucky enough to get any of them. The Mejri allows me to finally launch a series I have had in my plans for a while. 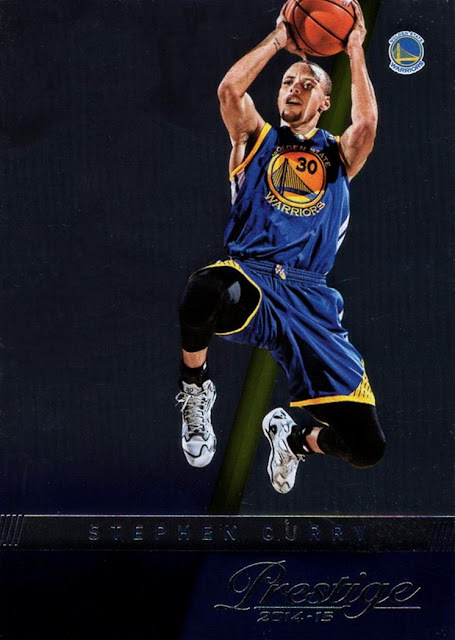 Seth Curry is entering his 4th year in the NBA, and he did get some cards in 2015-16, I just was unable to get any of them. The missing 6th player is Cole Aldrich, who got his first cards in 2010-11, but despite being in the NBA the entire time since then, had not gotten cards since 2011-12, he did have one card- with two parallels- in Complete last year but I didn't get any of them yet. One thing that should really be visible now is that each team has a color-coded scheme to each team. I really like it- it's not overbearing, it's very well done, and the colors pop. Last year's set was also color coded but I think I like this year's better- the wood paneling just looks so good it's hard to vote against it. Card backs, to be honest, are kind of a waste. No color, minimal stats and no player gets more than 5 years. At least they finally switched out which round a player was drafted in to what year. With only two rounds, listing them on the backs of NBA cards was pretty pointless. It's not like baseball or football with multiple days of rounds of drafts...or even the NBA, which had 6 rounds back in the day. Now, let's move on to the parallels. I really, really love the parallels in this set. 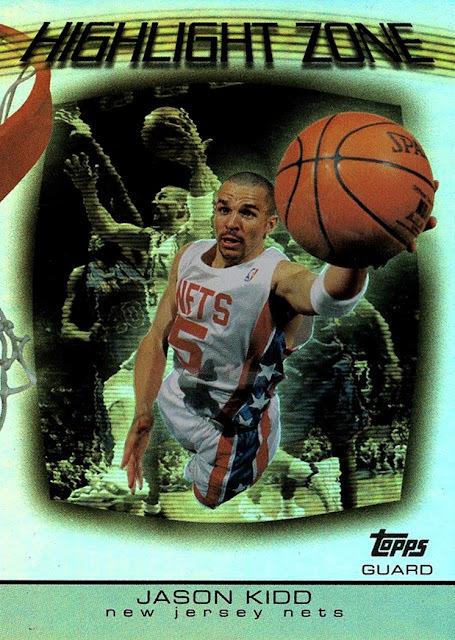 I'm one of those rare collectors who actually truly loves parallels, and as I mentioned in the post I put up on the day Mom gave me the box, my favorite card in the box was the green parallel of Kristaps Porzingis I posted there. Now I will post the other Green I pulled. The Greens this year are SN149, and I love them. Green has been my favorite color my whole life, the walls in my room are painted bright green, I'm wearing a green shirt as I type this. 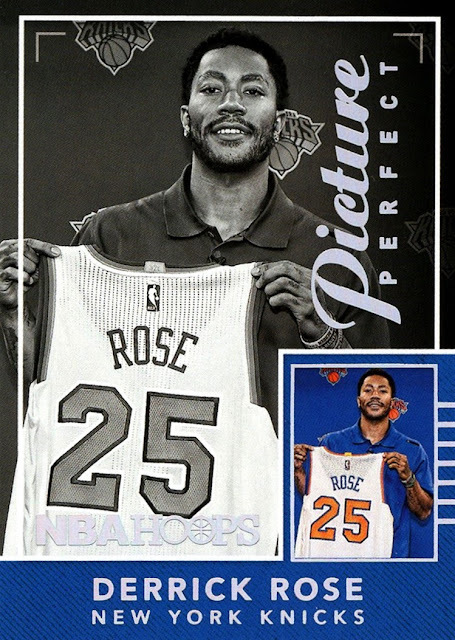 The cards are really spectacular in person- it's not really captured how great they are in this scan. Although they went from being a non-serially numbered set to being SN this year, they actually got slightly more common- last year they were one per box, this year I got two. The Gold design returned but this year is SN10, much, much rarer. I did not get any. The Red Backs return...unfortunately. There is really no point to these. I said the same thing last year. When I was opening my box, I thought at first I got a duplicate- until I turned it over. They could have at least used red foil for the Hoops logo (the only foil on veterans, the Rookies have the Rookie logo in foil as well). At least I pulled one of my 5 favorite players in the League. 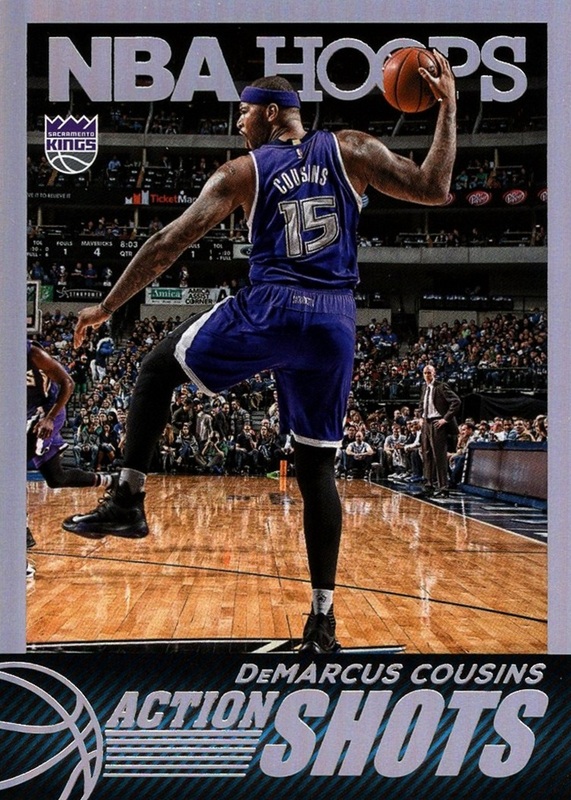 Silvers continue to be SN to 99, and I actually pulled three of them this year- the most I've ever pulled in a single year. Not only that, you can actually tell that the borders are not white in scans this year! I'm not sure if that's because the cards have changed, or if it's because I used a different scanner than I did last year. Now, the inserts. I'm not really an insert guy. I prefer base cards, then parallels of base cards, then inserts. But they are nice this year, thanks to being largely holofoil. I got several different inserts and I will show each below. Most insert sets are 20 cards, some are more and some are less. Many of them are 'heritage" sets, in that they are inserts that continue from year to year, instead of a brand new concept every year. I prefer this kind of insert. Action Shots has a lot of foil. Rare to see a shot of the back of a jersey on cards. Note the new Kings logo. Bird's Eye View is a fun set, which is mostly if not all shots from behind the glass. 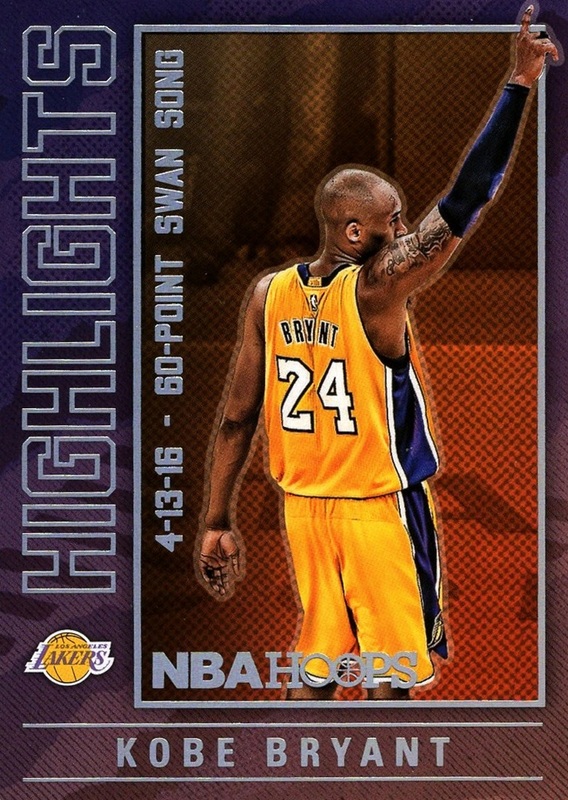 It's also all holofoil except for the player name and team. 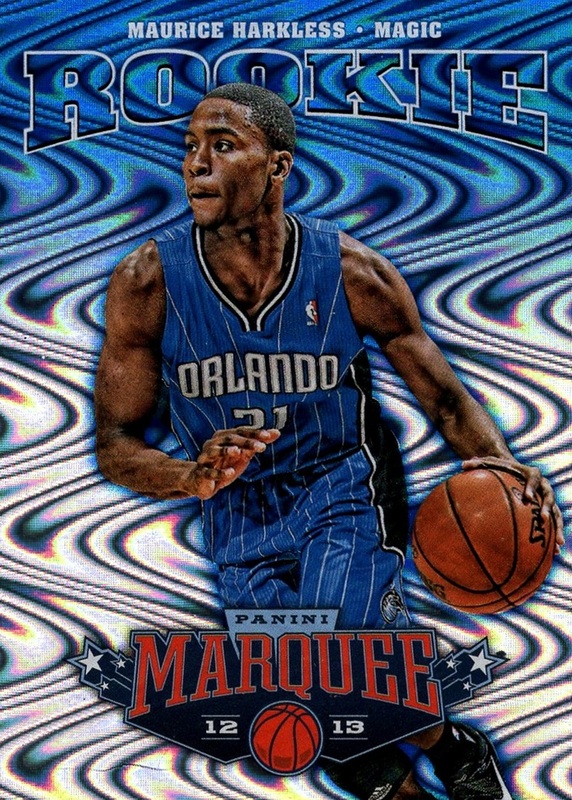 This is Rudy Gay. High Flyers has a great 1950s diner theme. 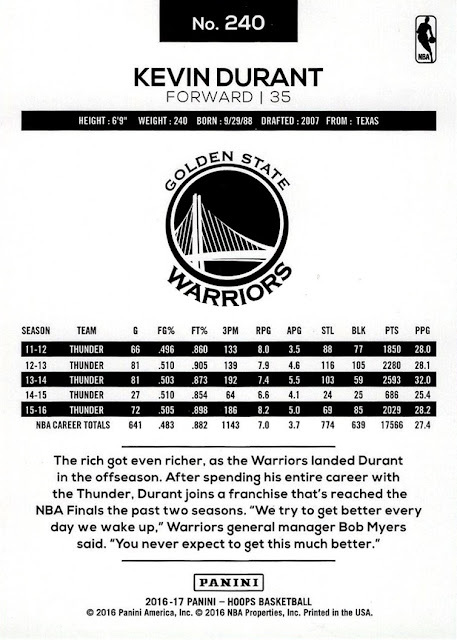 The white spots are part of the card. 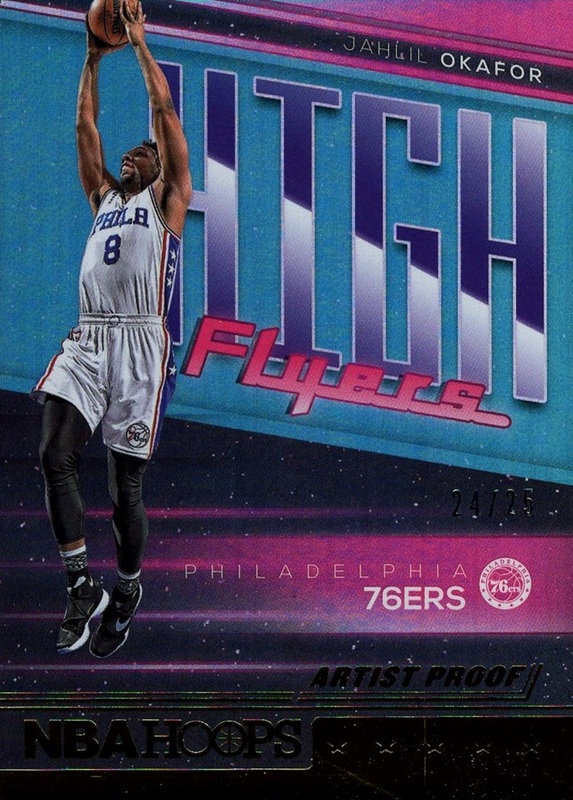 High Flyers Artist Proof features gold foil as compared to the base silver, and is SN25. I got the penultimate number. Hot Signatures returns and they are pretty cool looking this year. 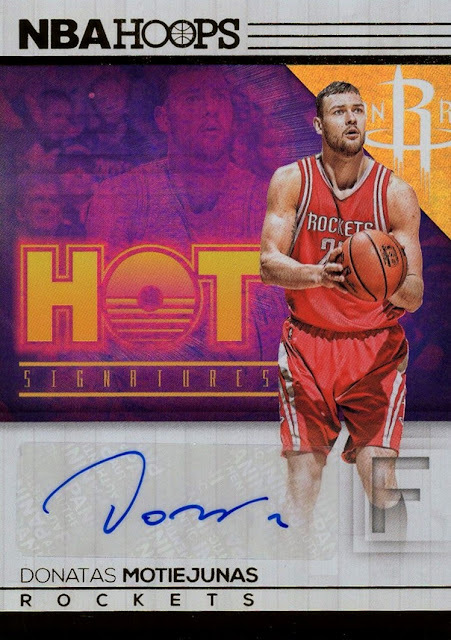 The sticker does not allow guys with longer names like Motiejunas to sign their whole name...although I'm sure they sign so much they wouldn't anyway! Kobe NBA2K17 is cards #11-20, while #1-10 are inserted into the video game of the same name. 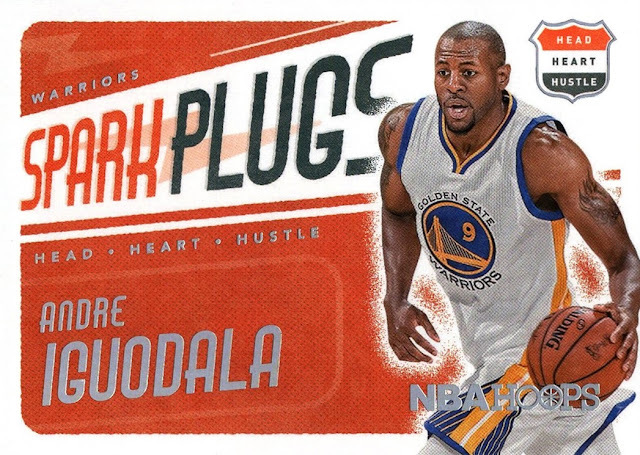 You get three of these per box and in theory it wouldn't be hard to complete the Hoops portion of the set. Some of the cards show actual photos. One on One returns and highlights some popular matchups. 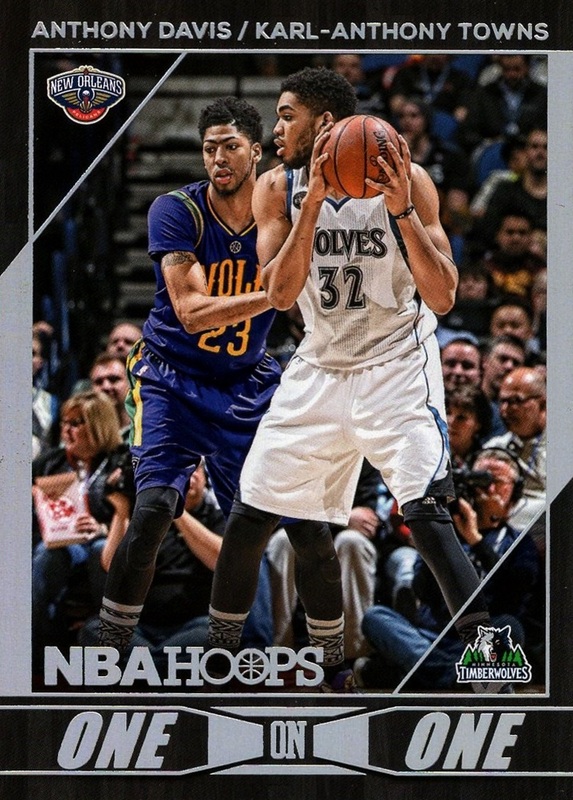 This was, unfortunately, the only Karl-Anthony Towns card in the box. Towns has supplanted Anthony Davis here as "The Next Big Thing" and watching T-Wolves games, it's easy to understand why. The term "gifted" does not adequately describe how good he already is- and he's only going to get better. Davis has battled injury and has very little in the way of supporting cast so his skills are kind of being overlooked, but his potential is also very great. Picture Perfect...meh. We live in the 21st century, black and white photography should be a thing of the past. 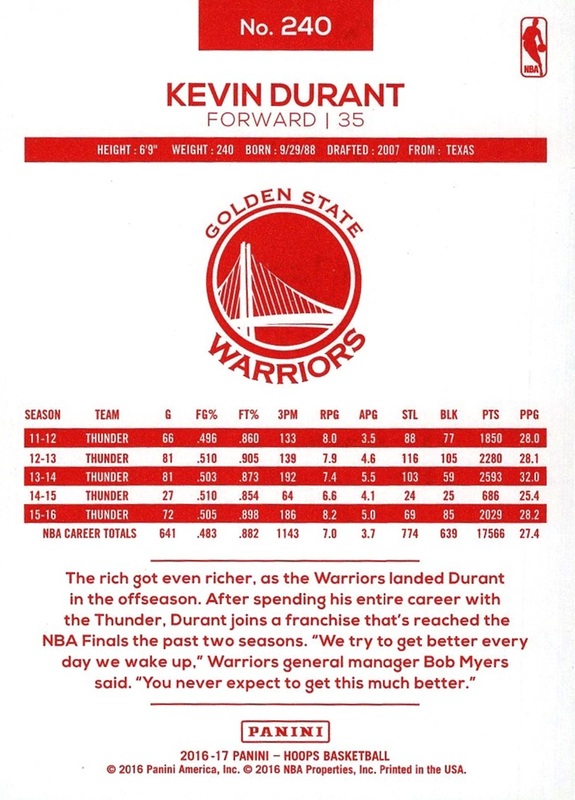 Road to the Finals, while serially numbered, is actually the most common insert. 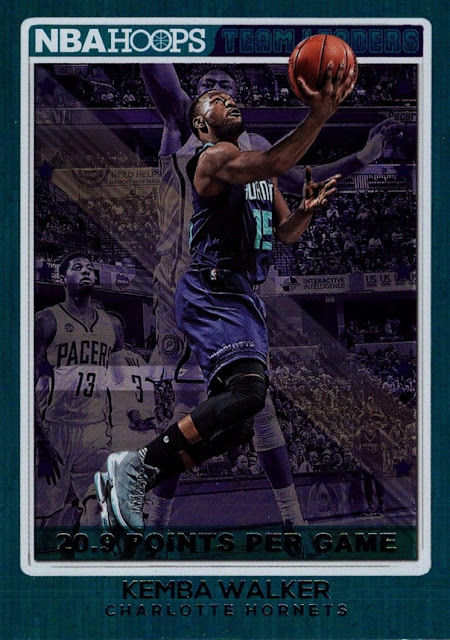 It is the third year this insert has been in Hoops, and I absolutely love the concept. Every single game of the Playoffs gets a card, with each round decreasing in number of copies produced. 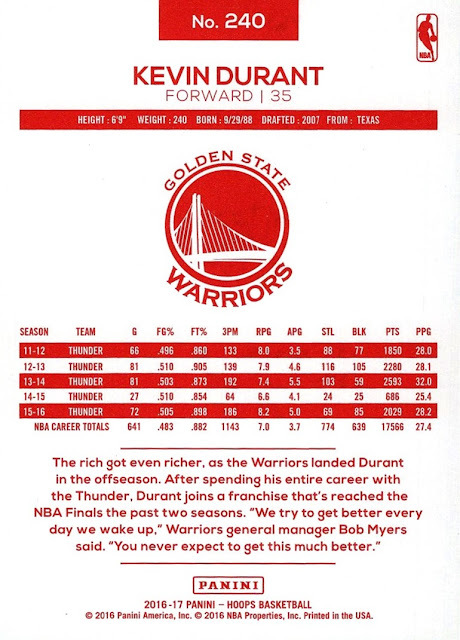 Round one had 2016 cards, round 2 had 999, the next round had 499, the conference finals 199 and the NBA Finals had 99. At 86 cards completing the set would be tough, but I love it all the same. I got 5 in my box. 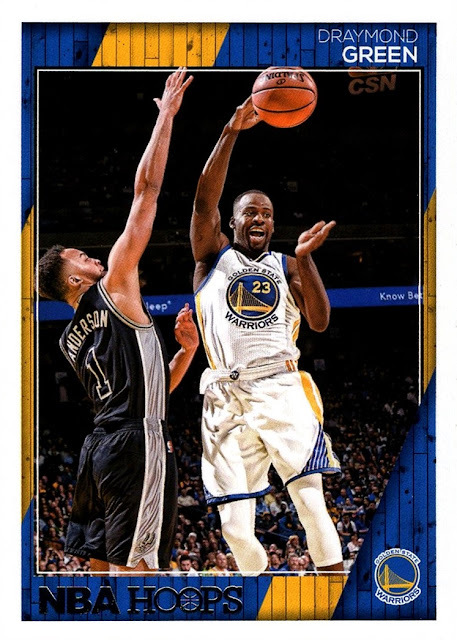 If I were running Panini, there would be a set where EVERY single game of the season got at least one card. Spark Plugs returns for the first time since 2013-14 now adding holofoil. It returns to the horizontal format last used in 2012-13. All years of the set have had an orange theme. Team Leaders is in it's second season, and is all holofoil. I got two in my box. Unfortunately each team only gets one card, instead of cards for each category's leader per team. 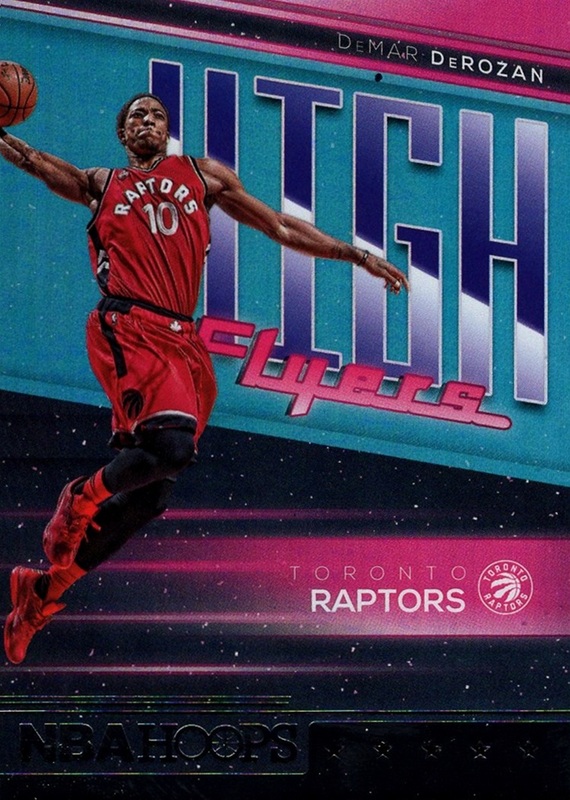 Like the parallels, there are plenty of retail-exclusive inserts, none of which appear in my collection yet. In total, I got 288 new cards, 259 of them being base cards, with 8 parallels and 21 inserts, which include the two autographs. The base set is 300 cards, and I will be attempting to complete it via retail purchases (also hoping to get some retail parallels in the process). For the third year in a row I did not get a single duplicate. Here is my Box Break Review of 2015-16 Hoops, the first set to have me post a Box Break Review in multiple years since I started Cardboard History. Loved it then...hate it now.